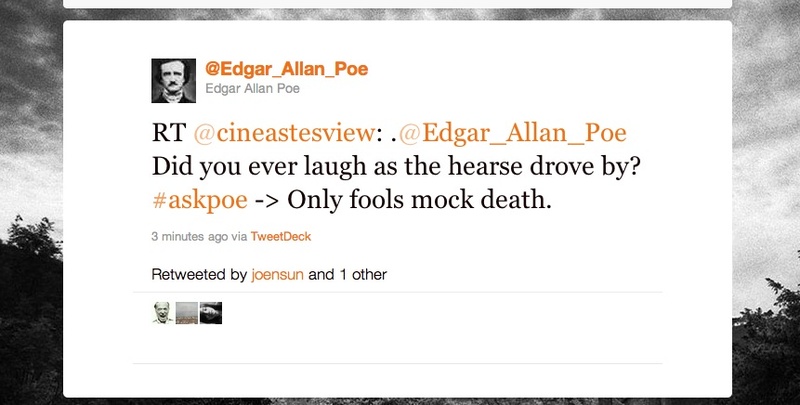 If you don’t already, you should follow @Edgar_Allan_Poe on Twitter. Whomever is behind this icon’s, well, icon, is an unknown but they know their Poe. And they have a wicked sense of humor to boot. Occasionally, this user will host an #askpoe forum, which is generally quite amusing. I’m not going to lie — my heart did a little flip when Poe (shh… don’t remind me he’s dead) answered one of my queries. Dead for 162 years and still making the girls swoon. At least bookish ones like me.